This is an attempt to create a realistic model environment to picture my figures in. The problem with structures like this in 1/6th is their sheer size , and possible weight. I've got round that to a degree by making it all from insulation foam , surfaced with filler , and building it in a series of sections which can be moved around to create different perspectives. I have displayed this on the forums as a Work in Progress, which it is true : but I never intended to finish it in a fixed form , because that makes storage difficult : it's more of a moveable stage set to which items can be added at need. Trenches on the Western Front varied considerably. This model is based on a collection of photographs taken ( illicitly ) by Lt. Harry Colver, of the York and Lancasters in Flanders in 1915. The watertable is so high in this area that they had to raise the trenches into sandbag walls , rather than digging down into the morass. 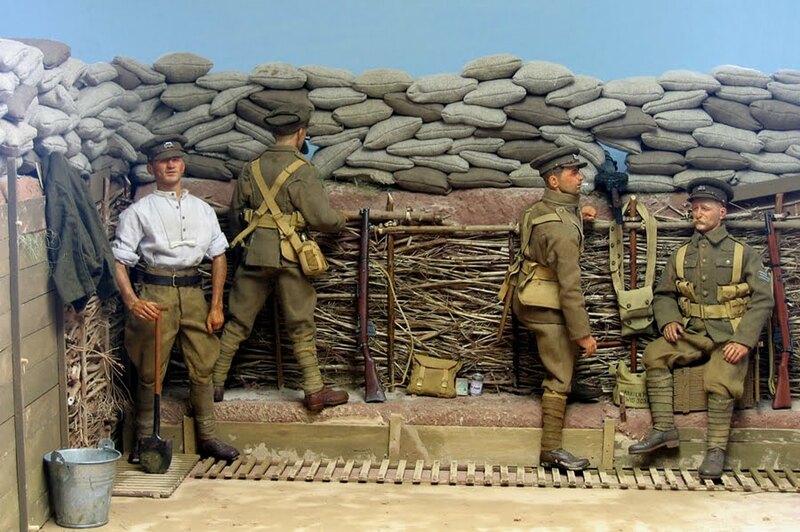 As a result in the summer weather they are very dry , unlike the popular notion of the average trench. 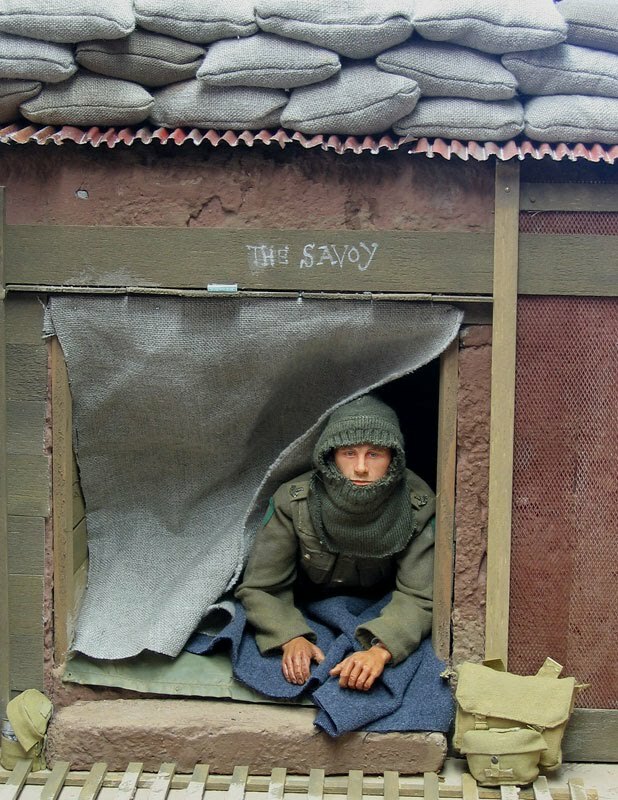 Millions of sandbags were used , and the revetting included planks, brushwood hurdling , corrugated iron and chicken wire : anything that could be scrounged by the soldiers, who spent a great deal of their time building and maintaining them in a quiet sector. The figures are notionally from my local battalion , the 5th W.Yorks , but I confess I have not badged them perfectly, but used figures from other Regiments in the scenes to make up numbers. 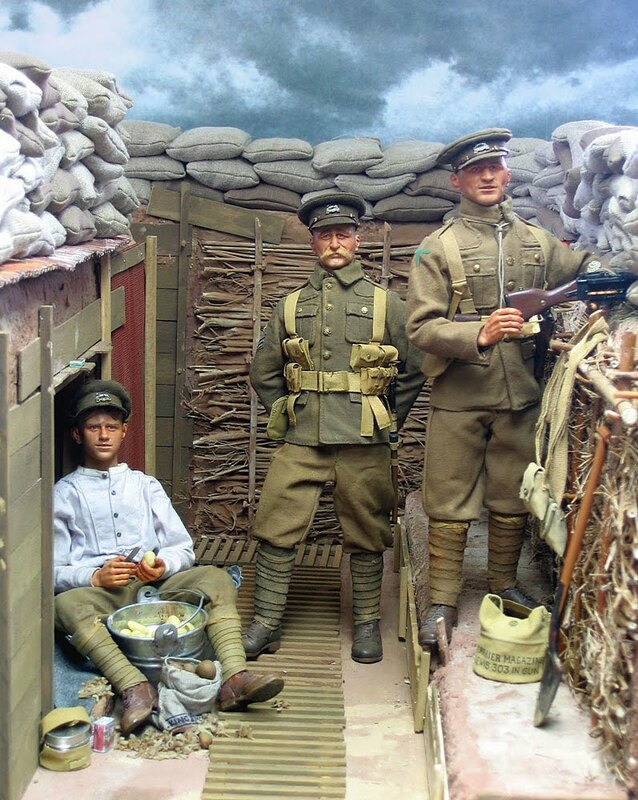 There are lots of things I should like to change and add : but making WW1 figures is not easy , because of the lack of available commercial items , so for the moment I have to be content with the figures I have. I just hope it creates some of the atmosphere of the original photos. The sandbags I sew up from unbleached linen , and fill with... sand.The brushwood was gathered in the autumn locally ; it's actually the stalks of local plants, dried. The potatos and peelings are made from polymer clay , a wonderfully versatile material : after 20 years of using it , I begin to believe you can make absolutely anything you fancy from it. The Rum Ration , the high point of the soldier's day : brought forward and carefully issued by the Sergeant-Major. 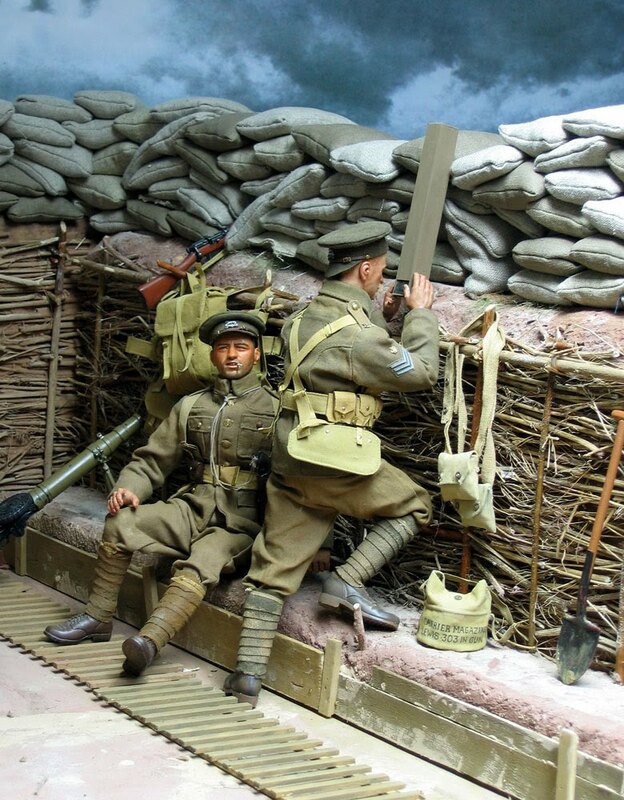 The SRD on the jar ( Supply Reserve Depot ) was commonly thought to mean " Seldom Reaches Destination " .